Today is a picture heavy post, so grab yourself a cuppa and a biscuit! First up is a card made with the 'Botanical Garden' stamp set by Altenew. I have had this set for a couple few weeks now and it hasn't seen ink in all that time and as I just had to have it at the time (much like everything else I buy), I thought I really ought to use it. I had an idea that I wanted to try the 'dauber colouring' technique that I have seen a few times on You Tube, as it is a nice quick and easy colouring method that can look quite effective. 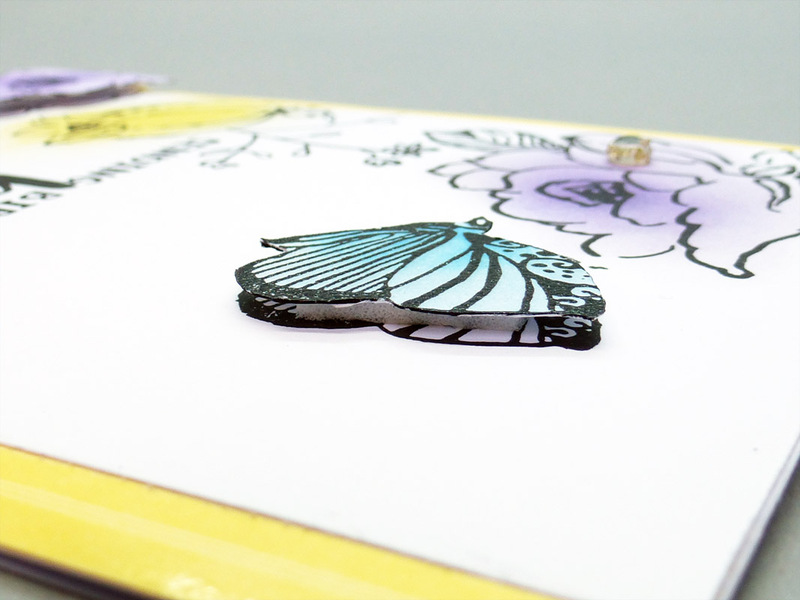 So, first off I stamped my images on to a white panel and stamped some of them again on to scrap pieces of white card-stock, because I wanted to layer some of them. The next thing was to choose my inks. I chose some soft colours by Memento. 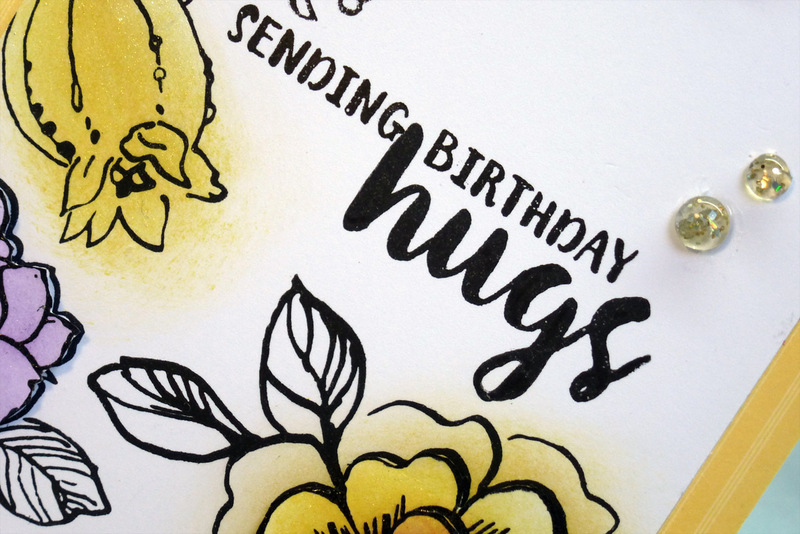 Then I coloured the images very loosely (not even trying to stay inside the lines, as that is not the look I was going for) all over the flowers, using some slightly darker colours for the centres and fading off more towards the edges. I wanted to leave some of the images white, so I decided to leave the the leaves uncoloured. Then I 'fussy cut' some of the layers from the extra images that I had stamped and coloured, and layered them up on top of the images on the main panel with foam tape for dimension. I felt that as the colouring was unstructured, it needed that bit of dimension from the layering of the images. Now, this is where the 'upcycling' comes in. 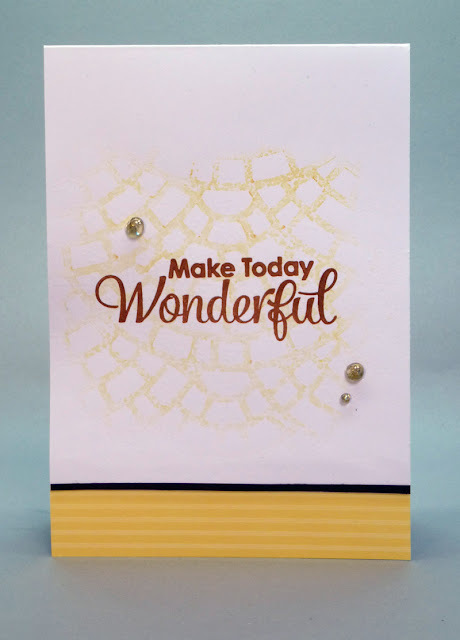 I had just opened an embossing folder from Taylored Expessions and I liked the soft, apricot/peachy striped packaging so before throwing it away I cut some strips from it and used a couple down the sides of my card base, with more on one side than the other. Then I mounted the focal panel on to the card base and finished it with three , glittery home made dew drops. This is my first card (stay tuned, there is a second one after this). I still had some pieces of the Taylored Expressions packaging left and a card base that I had used the 'stencil monoprint' technique on and decided not to use, so I just grabbed it, stamped a sentiment and stuck a strip across the bottom and the last strip on inside bottom border and tied in the brown sentiment with a thin strip of brown card-stock (although it looks more like black in the photo, but it is brown, I swear) between the patterned piece and the white card base to tie in the brown sentiment. Again, finishing with three more of the home made 'dew drops'. Here it is. If you are still with me I applaud your staying power and thank you all very much indeed for your visits. I hope it was worth it! Have a wonderful week my friends, until the next time! People have been asking me how I made the 'dew drops', I did put the answer in reply to a comment, but for those of you who don't have the time to read other people's comments (who does?) here are the basics. I used WOW ‘Melt It Powder’. It’s from the makers of WOW embossing powders. You just put it into a foil case (a foil baking case would do, you can buy them from WOW, but suspect they would be cheaper from the grocery store) and you just put your powder in it (whatever amount you want, so there is no measuring involved), then you hold it with a peg/tweezers, anything to protect your fingers and melt it from underneath with your heat tool (don’t do it from the top like I did or you’ll be dusting it off every surface for weeks) ;) Then, when it’s melted you just drop drops of it out on to your craft mat/baking sheet and allow to set. If there are any misshapen ones, just pop them back in the foil container and re-melt it. It melts very quickly. I added some glitter to some of them, and some were just plain. I’m going to experiment with colouring some with some Brusho powder too! These are beautiful!! Love your 'upcycling'! 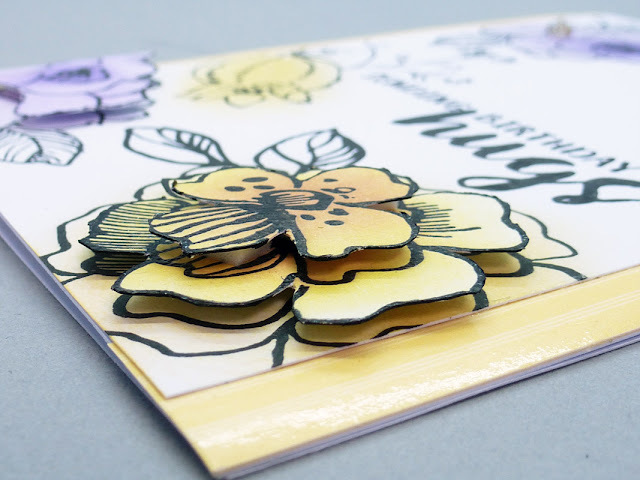 lovely card Hazel - the daubing is so effective for coloring those flowers - love it! So proud of you for upcycling and not wasting any of that packaging! That flowery card is amazing and I enjoyed reading about the process! Have to try the daubing technique! The second one is a great CAS card! 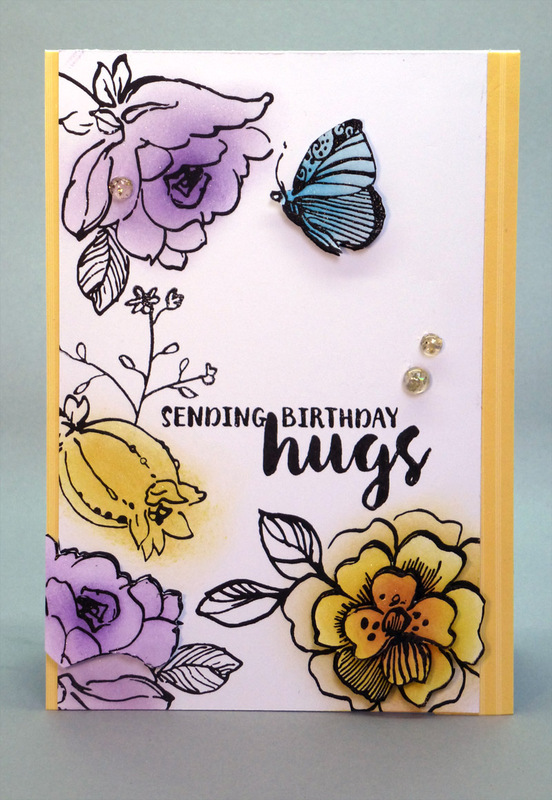 Your cards are both wonderful, Hazel, and so clever! I love how you upcycled some packaging and made your own dew drops. Your homemade stamping tool looks pretty awesome, too. Would love to have more details on how you made it. The MISTI is SO expensive!!! I bought a cheap picture frame (£3.50) a couple of hinges (£2.00) and a sheet of 3mm Perspex (£3.50) and a magnetic sheet (£1.00) and all I did was lay the picture frame down (face up) and carved/gouged two recesses on the frame for the hinges to lay flush. 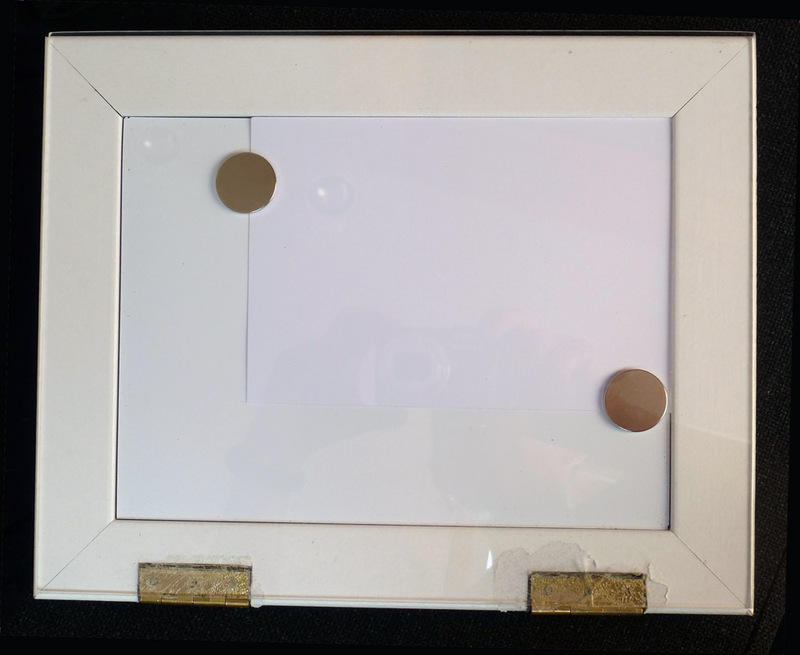 Then I screwed the hinges to the frame and stuck the other part of the hinges to the Perspex (because I was afraid of cracking it if I drilled it for the hinges). Then I just cut the magnetic sheet to size and lay that in the bottom . . . oh, yes, I also bought two very strong magnets from eBay for (£1.00) each!! Et Voila!! LOVE the negative of your stencil monoprint. It works perfectly with your packaging, and looks amazing with the brown tied in. Thank you Loll! The dew drops were made thus: I took a pot of WOW ‘Melt It Powder’, tipped some into a foil container (the sort you use for baking pies etc, WOW sells these too), then I took my heat gun and melted the powder – from the bottom – don’t make the same mistake I did and try from the top, I am still dusting it off surfaces today – and probably will be for a week!! When it’s all melted, you just drip it onto a non stick sheet – I used my craft mat (oven liner) – don’t worry if some of them are misshapen, you can just pop them back into the foil dish and re-melt. It melts and sets really quickly. I added glitter to some of the mix and those were the ones you saw on those cards. I also had some plain ones. I am going to try some with some Brusho powder mixed in to see if I can get some coloured, translucent ones too. 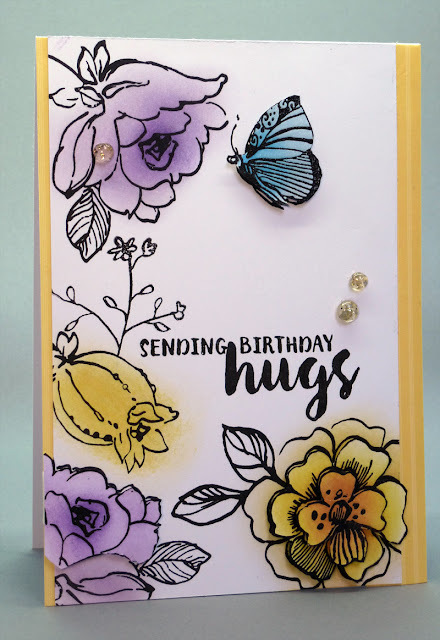 Love both cards and beautiful photos Hazel! The popped up layers on the first card are gorgeous! Wow! I also like your stamping tool! I was reading how you made the dew drops, great idea! I will have to reread and try it myself! Fun sponging! Good for you making your own - - - - - machine!! OH, the color combo you have used is brilliant! This is a very stunning card! I love how you have finished off the inside. This is a winner in my book! Enjoyed reading and learning from your blog today. Totally understand about 'needing' to buy things and then when we do we take a few weeks to actually use them! 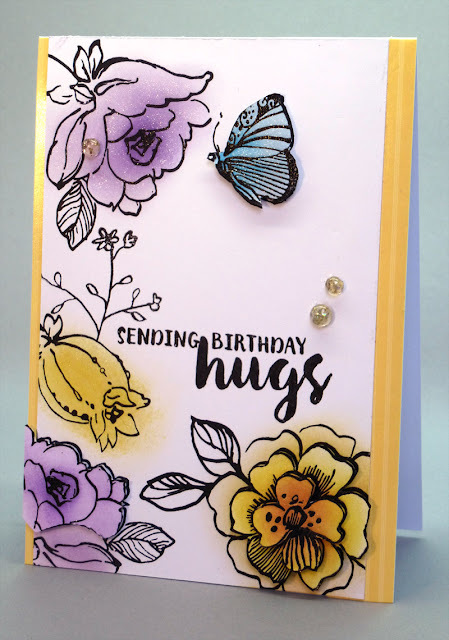 Beautiful cards and loving the daubing effect and the colours you've used. Oh, I really like how you've done the colouring on the first card, Hazel!!!! 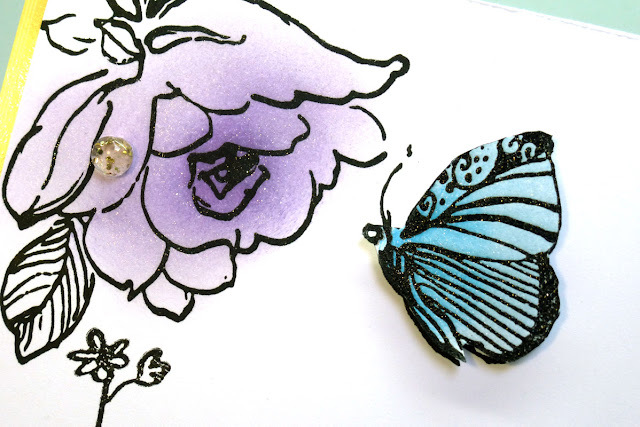 Beautiful flowers and butterfly and yeah for re-cycling, my friend!!!! 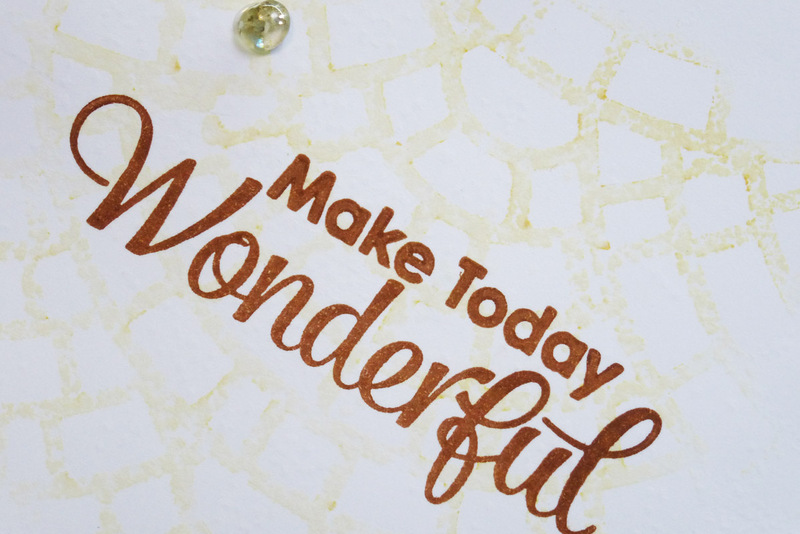 The stenciling on the second one is great and I love how the sentiment really stands out in the brown!!!! The strip at the bottom works perfectly!!!! Both stunning cards, my friend!!!! 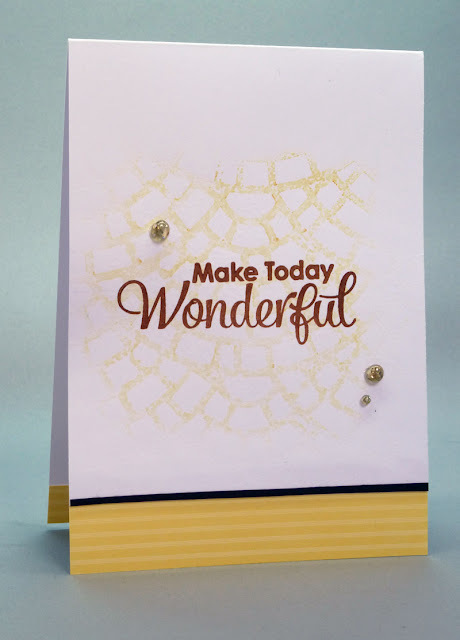 And you made your own dewdrops ...you are so clever and always have these wonderful ways to make your own stuff to use on your cards, Hazel!!! ...no way I would find 'Melt it Powder' here ...have never even heard of it!!!! Have a wonderful day, my friend!!! You have some fantastic ideas, Hazel. The Minute You Have All Been Waiting For! Handwriting Practice . . . use it or lose it! Darnell's April Fool's Day Boo Boo Blog Hop!